Trends in contemporary German literature are not easy to spot. Even the German Book Prize sheds little light, although it does help a few novels get more attention. In the past, the German book industry looked west in envy. In the US, UK and France, fiction awards guaranteed public attention and blockbusting sales. The others had glitzy Booker, Pulitzer and Goncourt prizes – all Germany had were its quarrelsome critics Marcel Reich-Ranicki and Elke Heidenreich. At one time, booksellers could blindly order books listed for discussion in the upcoming Literarisches Quartett – a 1990’s TV programme – but those days, too, are long gone. No TV arts programme, no lead story in Der Spiegel Magazine and certainly not a review in DIE ZEIT, FAZ or Süddeutsche Zeitung makes a book a bestseller in Germany today. But natural factors help shape trends: good critiques, bookseller recommendations, blogger comments and – last but not least – reader reviews on Amazon. There is precious little scope here for exerting influence. Most publishers have tried for years to tweak as many parameters as possible to make a book a bestseller – but very few have succeeded. But is it possible to identify preferences and even the vaguest of trends in the colourful mix of what people buy? A look at the successful titles of recent years reveals at least one clear trend. Possibly a reflex in times of global uncertainty, a remarkable number of novels are set in a ‘safe’ rural context and focus on relationships, families, women’s lives, village and small-town communities. This is true of Juli Zeh’s 2016 title Unter Leuten and her current novel Neujahr as well as Dörte Hansen’s surprise hit Altes Land (2015) and her equally successful follow-up Mittagsstunde. Mariana Leky’s Westerwald novel Was man von hier aus sehen kann, which has sold in hundreds of thousands, is another example, as is Arno Geiger’s novel Unter der Drachenwand, which calmly and collectedly tells a touching tale from the Second World War. Last but not least, the description also fits the reverse chronology family epic Archipel by Inger-Maria Mahlke, winner of the 2018 German Book Prize. None of these novels ignores social and personal problems; people are deceived, suffer, die. But the writing is comparatively conservative and realistic, untrammelled by modernisms and linguistic reflections. That makes the books easy to read and goes some way towards explaining their success and the emulation that has been observed for years. 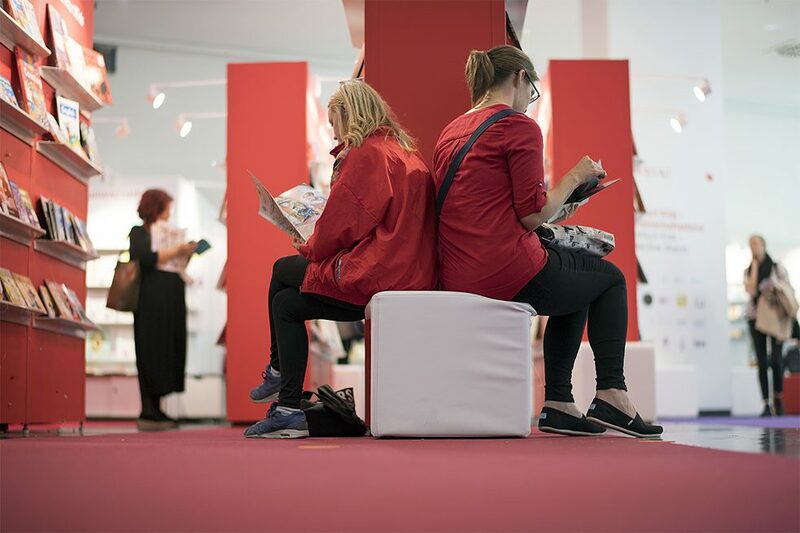 Two women browse back to back at the Frankfurt Book Fair, where the German Book Prize is awarded. Women account for two thirds of the novel-reading public in Germany. | Photo: ©picture alliance/SvenSimon/Anke Waelischmiller Storytellers who offer pessimistic tales that extrapolate negative trends of the present into the future face a more uphill struggle. They include August Christian Torkler’s Der Platz an der Sonne, a bold intellectual experiment that turns the world upside down: Africa flourishes while Europe descends into poverty. Julia von Lucadou’s debut novel Die Hochhausspringerin is set in a totalitarian society where daily life is defined by a duty to keep pushing forward the boundaries of personal performance. Eckhart Nickel’s novel Hysteria describes a world where there is no natural food but where people are oblivious of the fact that they are trapped in a totally artificial environment. These books and a number of similar ones – though many of them mordant portrayals of doom and gloom – have been discussed at length in the literary press and often showered with praise. But they have not made it right to the top of the charts. The books shortlisted for the 2018 German Book Prize were also mostly in the first of the two categories described above. What is more, none of them told a tale set in the future or even in the present. 2018 will surely go down as one of the more mediocre years in the award’s history. No work of fiction outshone the rest. The longlist included ten historical novels and ten with a topical theme. It is perhaps understandable that Michael Lentz’s idiosyncratic novel Schattenfroh – a thousand-page requiem for a father – failed to make the list but Daniel Kehlmann’s Tyll and Robert Seethaler’s Das Feld were very likely sifted out because they already enjoyed the popular success that, to some extent, the award was supposed to deliver. Winning author Inger-Maria Mahlke at the 2018 German Book Prize award ceremony. | Photo: © picture alliance/dpa/Arne Dedert/ So there are a few odd aspects to the German Book Prize. No jury that is newly constituted each year – no matter how balanced it is – can objectively identify the year’s best novel. But the award is probably the best of all imperfect tools to bring at least a handful of books to the attention of a wider public. In that sense, it is actually a good thing if there is a row about which books should have been on the list – because that means they are talked about. Readers can be guided and thus help nominated fiction fly off the shelf. 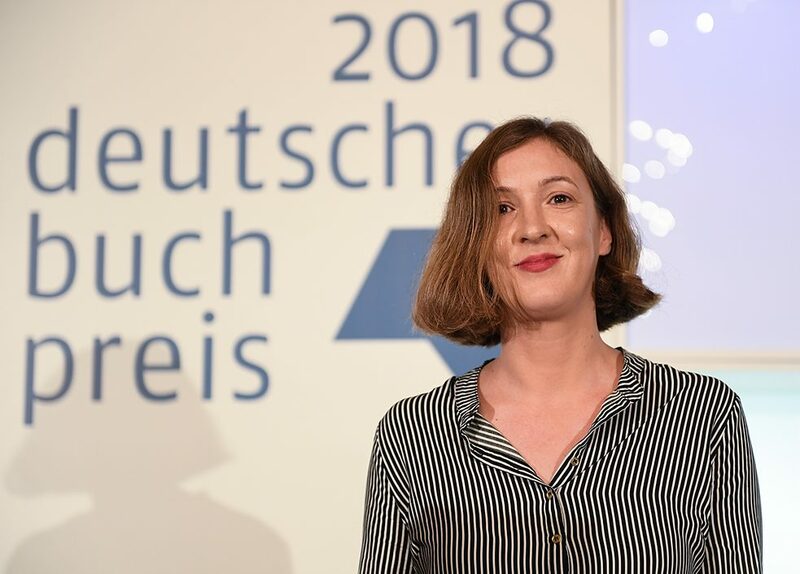 Even long-term critics have to accept that the German Book Prize is capable of giving novels that would otherwise be read by only a small privy minority the attention they deserve.